The building design will incorporate steel, glass and greenery into a modern cutting-edge urban campus in a garden setting that will reflect Star’s position as a visionary industry leader. 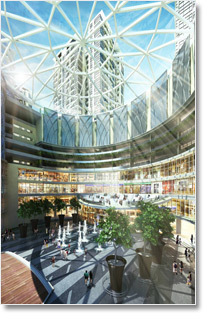 The 5 Towers will present a contemporary even ‘futuristic’ aesthetic setting a high bar for design and construction. The entire site including the Tower decks will be heavily landscaped to establish a green city oasis, enhancing indoor/outdoor spaces and serves to also soften the visual impact of the podium and Towers. The STAR PUBLICATIONS COMPLEX will be catalyst for the redevelopment of this emerging commercial district of Petaling Jaya. With a vibrant programming mix of diverse businesses and people, the project has the critical mass to establish a new development direction for Section 13. - Heavy landscaping on the ground as well as garden decks interspersed between tower floors. - Rain harvesters built into courtyard canopy to reduce use of potable water on site. - Photovoltaic panels on the top of the towers to provide electricity and reduce energy costs. - Intelligent use of materials eg. High efficiency double glazing. Mixed development of commercial space and residential units.